A quiet few days. No complaints. Had a good day off Thursday, after a chill Wednesday night on the L&D deck. Haircut, car wash, and other personal-infrastructure matters, attended to. Rode my bike in the park, vigorously enough to remind me that the legs are not yet in top form. But I already knew that from the last few ski runs of the season just past. My wife was out of town this weekend, and our nest is otherwise empty. So I volunteered to pick up a few extra call shifts. I’m not as self-sacrificing as that might suggest; I have two kids in college, some new camera gear to pay for, and vacation coming up. Friday was a good day in the OR; a couple of short GI endoscopy cases, a spine case, and a GYN/General Surgery combo. No complications, no disasters. And then the phone lay silent all night. Saturday and Sunday I was a low-priority backup-call guy, and the quiet continued. Garage, cleaned and (kinda) reorganized. Uncharacteristically for Denver, it’s been rainy and overcast — garage-cleaning weather. Regarding camera gear, the latest photo acquisition is a Hasselblad 903SWC, of early-90’s provenance. Hasselblad created this camera to provide a vehicle for one of their sweetest lenses ever: the 38mm f/4.5 Biogon. (The name refers to its optical design, the arrangement of the individual “elements” which make up a lens, and which imbue it with its personality.) This lens is a super wide angle lens, with around a 90º field of view. If you own a full-frame digital or 35mm film camera, this lens corresponds roughly to your 25mm lens – so it’s pretty darn wide. Even though the Biogon is a very wide-angle lens, you don’t see the freakish distortion you see with other wide-angle lenses, wherein things close to the lens look clownishly large in the image, and lines at the periphery are bent at crazy angles. If memory serves, the camera was designed for technical and architectural photography, at which it excelled — and for which straight lines without distortion are crucial. But it quickly became a much-prized general-purpose tool for all kinds of pictures, even fashion and portraiture. 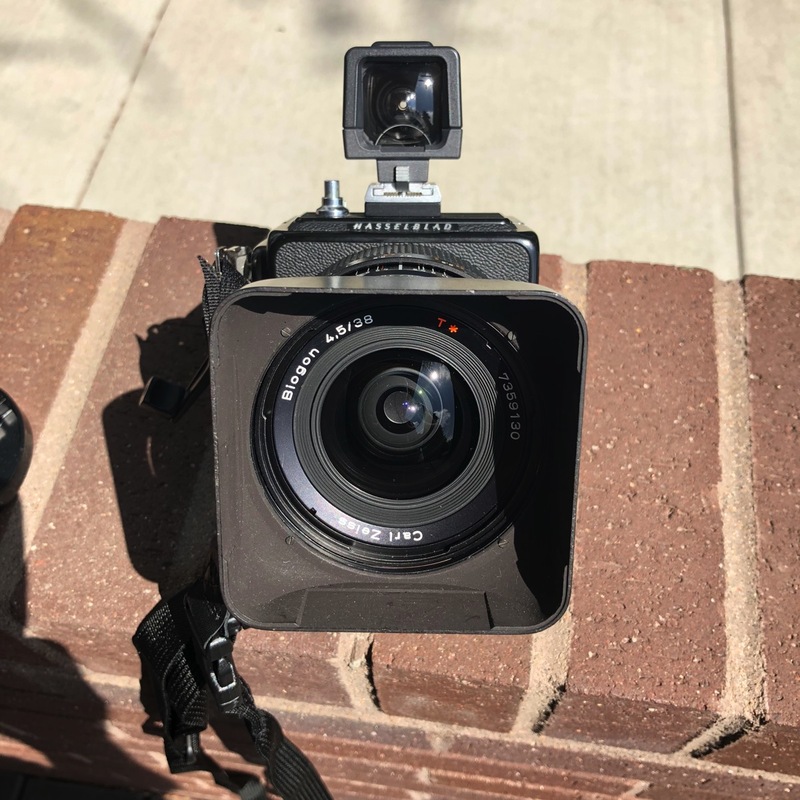 Wide-angle lenses are generally the last thing you think of for those genres, but they work with the SuperWide, because the lens is that good. I am often asked why I still shoot film. 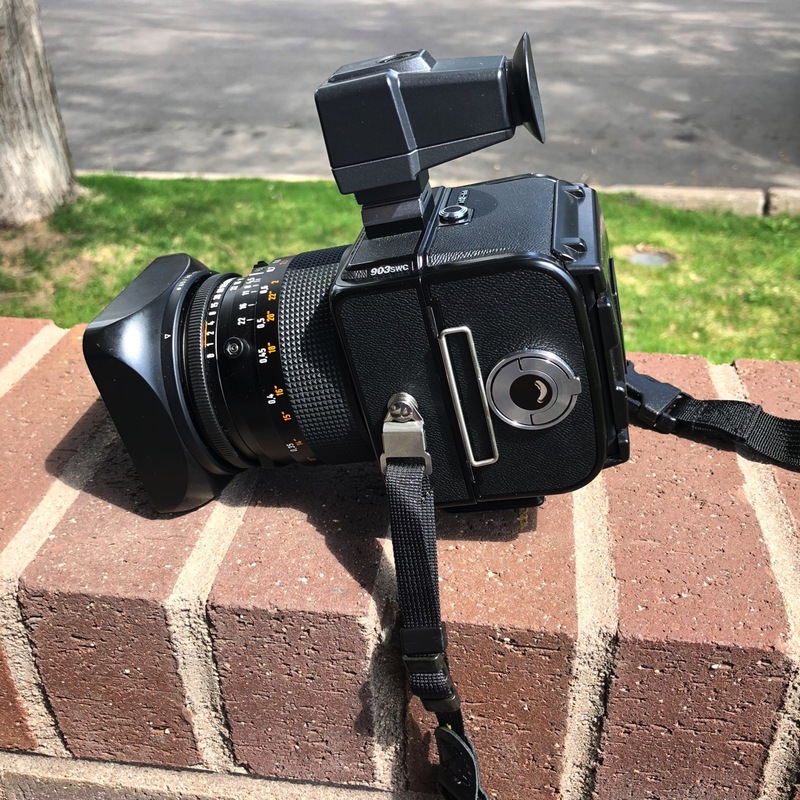 Being a guy of a certain age, I learned photography in the pre-digital (prehistoric, to some of you) age, and I’ve always loved the rituals of shooting and processing film. I did my own darkroom work for years; as soon as I move to a suitable house, I’ll set up my brand-new film processor and resume that pleasant diversion. Film’s limitations become a virtue, by providing challenges to overcome to get to the final image. And, being analog, you never know quite what you’re going to get. I like the feeling of shooting a picture you won’t see until you open the developing tank, or the envelope from Mike’s Camera. Plus, I like the look of film – simple as that. I also shoot digital, when it’s the better tool for the job. Like everyone who lived through the film-to-digital transition of the early 21st century, I’m thoroughly bored with the film-vs-digital online flame wars that we all had to put up with. Each medium has its place in the toolkit. If I were shooting for a living, I’d be shooting mostly digital, until I found the rare client who’d put up with film’s cost and workflow disadvantages. But since I shoot for the joy of it, I get to use fabulous old mechanical cameras, and wait a couple of days to see the result. I’ll take that trade-off in a Massachusetts minute.